Navy Pier is Illinois’ No. 1 tourist attraction. 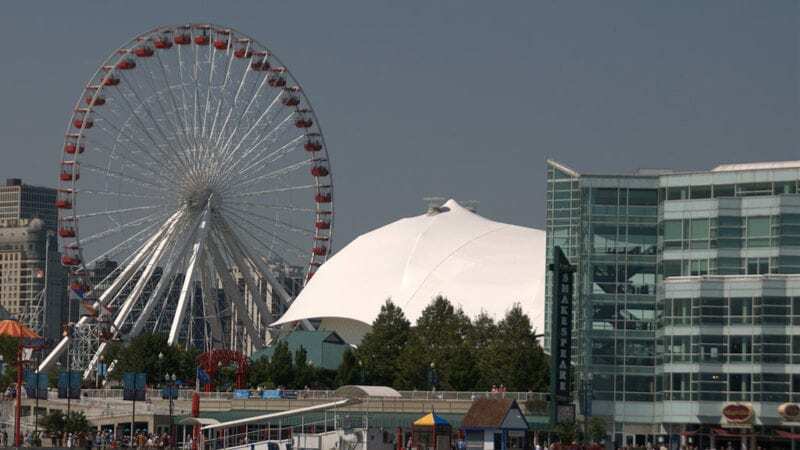 The lakefront Chicago destination is home to plenty of family fun entertainment, including an IMAX theater, the Chicago Children’s Museum and fireworks every Wednesday and Saturday night from Memorial Day to Labor Day. Reigning over it all is the Navy Pier Ferris wheel. Now, the city plans a bigger, better, taller Ferris wheel that will open in 2016 as part of the pier’s 100th birthday celebration. Chicago is the home of the Ferris wheel. 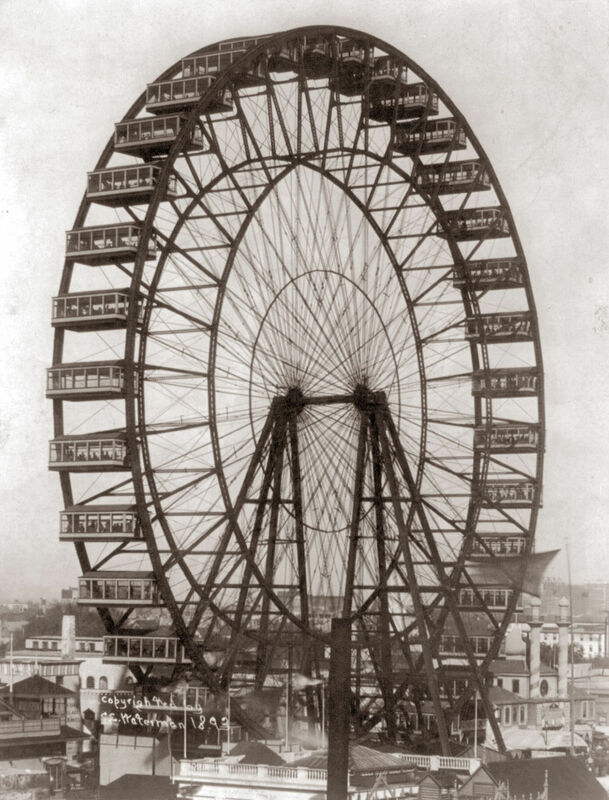 George W. Ferris invented it and unveiled his creation in Chicago at the 1893 Columbian Exposition. So it seems only fitting that a Ferris wheel should be a fixture at Navy Pier, Chicago’s lakefront tourist destination. 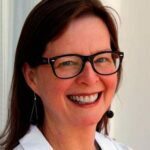 While none of us Chicago TravelingMoms have forked over the $8/person to take a ride on the Ferris wheel, it is a big lure for visitors to our city. 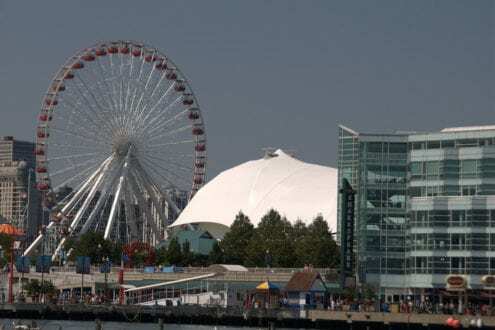 The current attraction, which opened in 1995, will be torn down and bigger Ferris wheel erected on the same spot in time for the Navy Pier centennial celebration in 2016, Mayor Emanuel announced in a press release. The new Ferris wheel will be 196 feet tall, 49 feet higher than the current one, which will continue operating through the end of the 2015 summer. The new gondolas will seat up to 10 passengers (the current wheel holds six), include padded seats, TV screens and speakers, and will feature an innovative HVAC condensation drainage system that collects and releases water when gondolas are at the bottom of their rotation to prevent dripping and clouding during rotation. The cars are two-sided to allow for easy loading and unloading. And, perhaps most important in the Windy City, the structure is fortified withstand winds of 115 miles per hour, and safety glass capable of weathering intense storms. The new ride will be able to accommodate 180 more passengers per ride and include temperature controlled gondolas so it can operate year-round. Riders will get a 12-minute spin with amazing views of Chicago’s iconic lakefront skyline. Chicago’s new Ferris wheel isn’t the world’s biggest. That honor goes to Las Vegas with its 550-foot-tall High Roller that opened last year. That Ferris wheel eclipsed the 440-foot London Eye, which opened in 2000. The size of the new wheel was selected because it fits in the footprint of the current wheel. As such, Ferris wheel operations will be closed for construction during the off-season months beginning in late September 2015 and re-opening in summer of 2016. 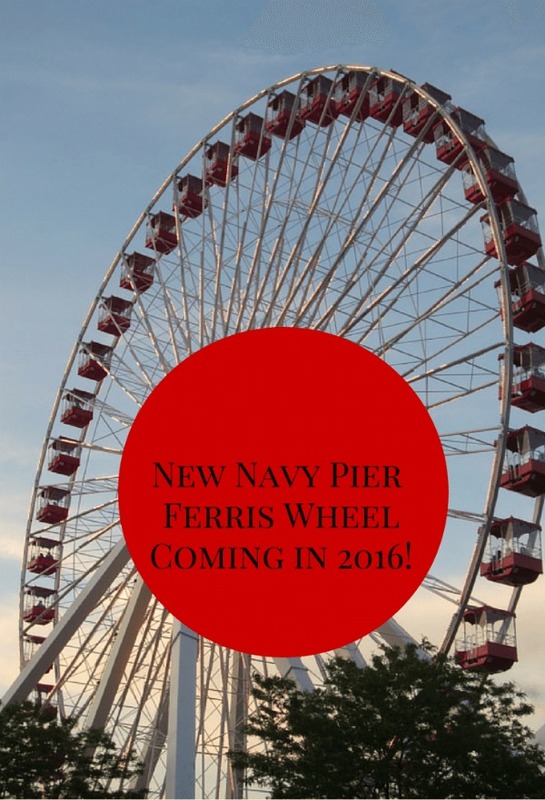 Navy Pier officials spent six month looking for the right wheel that could meet the unique structural and operational requirements of the Pier. The winner: the DW60 from Dutch Wheels, the Netherlands-based company that built the Pier’s current wheel. Similar wheels are currently in operation in Hong Kong and Baku, Azerbaijan.